If your Samsung Galaxy Tab 4 8.0 (SM-T330) has a broken screen Mountain Stream are here to repair your tablet for you. As of July 2015 UK parts for this device are in short supply but we can source them within reasonable lead times. Please see below for our fixed prices for repairs. Prices are inclusive of parts and return standard postage or personal delivery. 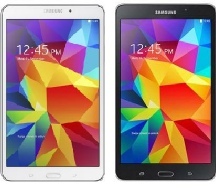 For other Samsung Galaxy Tab 4 8.0 repairs please request a quote by email, phone or by using our enquiry form. ALL PRICES BELOW ARE INCLUSIVE OF PARTS, LABOUR AND RETURN OF YOUR SAMSUNG TAB 4 8.0 (SM-T330) IN PERSON OR BY POST. PRICES DO NOT INCLUDE ANY PRE-REPAIR DIAGNOSIS. FOR A PRICE ON REPLACING ANY OTHER SAMSUNG GALAXY TAB 4 8.0 (SM-T330) COMPONENT PART PLEASE CALL, EMAIL OR USE OUR ENQUIRY FORM.